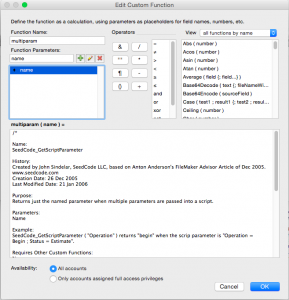 A common complaint about FileMaker (https://www.geistinteractive.com/2014/04/07/top-feature-request-filemaker-14/) is the lack of a native method to pass multiple parameters to a script. Many developers have tackled this problem using different methods, including include Word Count, Value Count, delimiting characters, and creating a dictionary. Read more at (http://www.merlyn383.com/home/2011/7/27/filemaker-passing-multiple-script-parameters.html). One of the most straightforward, stable and easy to use is a custom function from SeedCode (http://www.seedcode.com/pmwiki/pmwiki.php?n=SeedCodeComplete2.ScriptParameters). For simplicity and clarity, we started with the SeedCode custom function, but changed the name from SeedCode_GetScriptParameter to MultiParam. The new name name is shorter, to the point, and reminds you what the function does. At DBHQ, we use this custom function in every database we create. It’s a building block which will be used in other script examples on this blog. In fact, because we do use MultiParam in every database we create, you’ll probably see us employ it even when a script only needs one parameter and Get ( ScriptParameter ) would suffice. The logic behind this is that it’s much easier to use MultiParam (even when you only have one parameter) than to go back and retrofit if you later decide that your script is going to need more than one parameter in certain circumstances. In the code above, the word “action” is the name of a thing you’re passing. Its value is “start.” The semicolon marks the end of the first pair. Note that the spaces around the “=” and the semicolon are for legibility. If you just run the code together, the custom function will still work, but your parameter isn’t as easy to read. In this example, $action is will have a value of “start” and $status will have a value of “active”. You can string together as many parameters as you need for your script. Here’s one with three parameters, using a field in the second to illustrate how to construct the parameter when you introduce a field name in the center of it. Refer to “Creating Custom Functions” (ADD LINK) to see the steps to add this custom function to your database. The MultiParam function itself has one parameter (Name). 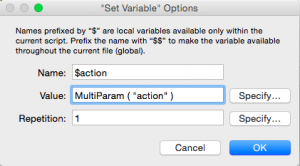 The MultiParam function should be made available to all accounts. Created by John Sindelar, SeedCode LLC, based on Anton Anderson’s FileMaker Advisor Article of Dec 2005. Returns just the named parameter when multiple parameters are passed into a script. SeedCode_GetScriptParameter ( “Operation” ) returns “begin” when the script parameter is “Operation = Begin ; Status = Estimate”. Where “Name” is the name in a Name/Value pair like: “Operation = Begin”. Separate Name/Value pairs with semicolons like: “Operation = Begin ; Status = Estimate”. If a requested value is not present, the result is blank. When we provide instructions for creating a custom function, we will specifically provide any Parameters which need to be defined, and also provide the code for the function. The actual code will be here. Do not copy the “Begin Code” and “End Code” lines, but do copy everything between them. 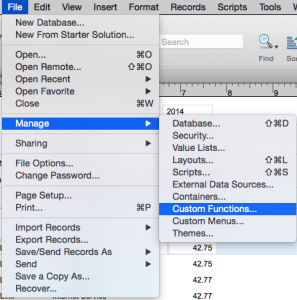 To create the Custom Function, select File—> Manage—>Customer Functions. 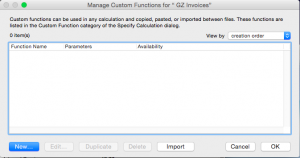 In the Edit Custom Function dialog box, enter the Function Name in the top left field. In the Function Parameters field, enter each parameter separately and click the “+” button to add it to the list. In the large field that encompasses the bottom half of the dialog box, paste the code we have provided.